1. The Rock Solid Tripod Cross Bar with 4 heads mounts to a tripod center column 3/8″ thread. 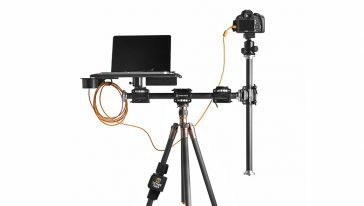 It can also mount to a lightstand using a Rock Solid Baby Ballhead Adapter. 2. When mounting to a tripod, ensure the 3/8” thread is exposed, or if using a lightstand, first add the Rock Solid Baby Ballhead Adapter. Add the Rock Solid Tripod Cross Bar to your tripod or lightstand using the knurled plates for easy mounting. 3. 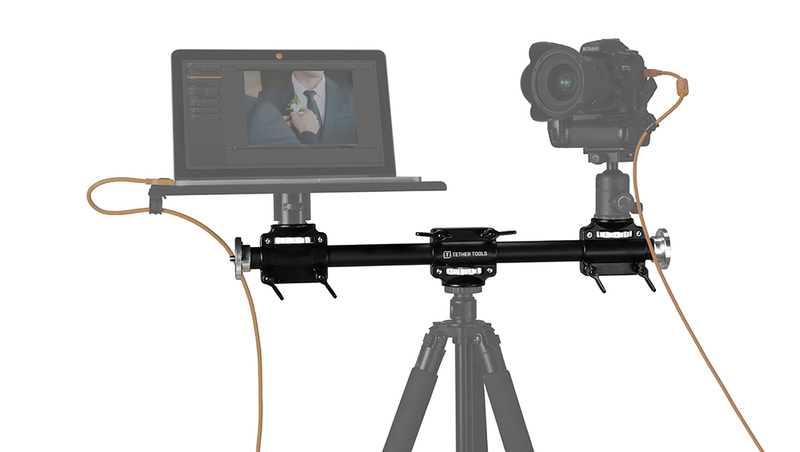 Lock the Tripod Cross Bar in place with the dual-locking heads, ensuring a secure fit. 1. To add gear with a female 3/8” thread to the two 3/8” male threads on the top of the Tripod Cross Bar, first align your accessory then turn the knurled plates clockwise before securing with the dual-locking heads. 2. To add gear to the two 3/8” threads on the side of the Tripod Cross Bar simply attach by rotating your gear with a female 3/8” thread clockwise. 3. DO NOT over tighten table or knob. 1. To clean your Rock Solid Tripod Cross Bar use a damp towel or soft cloth. DO NOT use harsh chemicals or abrasive cleaners. 2. DO NOT allow children to climb or play on stand or unit. Failure to comply could result in personal injury. 3. Only use product for its intended purpose. Failure to do so could cause injury and will void warranty. 4. The Rock Solid Tripod Cross Bar is rated to hold equipment up to 18lbs (8.16kg). However, always refer to maximum load limits on stands and tripods. Those weight limitations ALWAYS take precedence. Exceeding this load limit could cause unit sagging, instability, product collapse and/or serious injury. 30 amazing female photographers share their inspiration, challenges, process and final shots in the Women’s Edition of How I Got the Shot Guide. Go behind-the-scenes with fifteen photographers including Scott Kelby, Rossella Vanon, and Vanessa Joy in the How I Got the Shot Educational Guide – Third Edition. Twelve photographers including Jeremy Cowart, John David Pittman, and Easton Chang pull back the curtain on their latest shoot in the How I Got the Shot Educational Guide – Second Edition. Learn how ten photographers including Lindsay Adler, Clay Cook, and Karen Alsop, connect, collaborate, and create in the How I Got the Shot Educational Guide – First Edition.